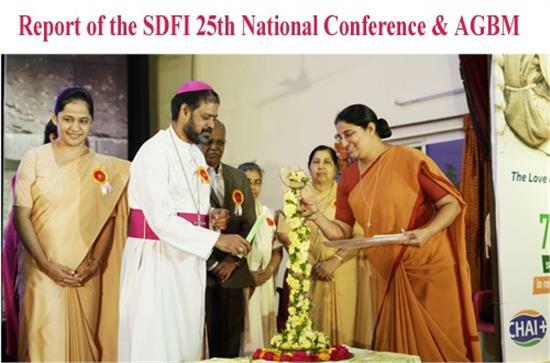 The Sister Doctors Forum of India (SDFI) held its 25th National Conference & AGBM at the CHAI Training Centre, Medchal, Secunderabad from Friday, 18th January to Sunday, 20th January 2019 in collaboration with Catholic Health Association of India (CHAI). About 150 sister doctors from all over India attended this event. In the last 25 years, the SDFI has grown from a small association to a forum of about 1000 sister doctors. The sister doctors have dedicated their lives in the service of the unreached and less reached of our country providing preventive, curative, promotive and palliative care service, especially in the rural areas and tribal belts of our country, where modern facilities and technological development are still in the primitive stage. For better organisation the SDFI has divided itself into 8 regions- Northern, North East Central, Western, Andhra Pradesh and Telangana, Karnataka, Tamilnadu and Kerala regions. The Sisters Doctors Forum of India (SDFI) organizes various activities and CMEs at the Regional and National level, engaging themselves in relearning, updating, etc. their professional expertise. Friday, 18th January 2019, was another auspicious day in the history of SDFI, as we began the 25th National Conference & AGBM based on the theme “Holistic Cancer Treatment… Palliative Care and Pain Management”. At the inaugural mass, Bishop Theodore commended the Sister Doctors for their total commitment in the service of the people and said that the people are attracted to the Sister Doctors who are nothing but agents of Jesus’ healing and touch. He urged the Sister Doctors to continue bringing Jesus and his healing touch to the people. He stressed on the ministry to the poor and marginalized. This was followed by the inaugural function wherein the SDFI Annual Report 2018, was released by His Lordship Most Rev. Bishop Theodore Mascarenhas in the presence of esteemed Guests of Honour. In his Presidential note, he conveyed the sentiments of the Church in India and CBCI who are proud of the Sister Doctors working with dedication and zeal for the love of God. He emphasized that, it is this loving touch that distinguishes them from the rest of the doctors. He also highlighted the significance of Palliative care and the role of Sister Doctors. Only a personal level care can infuse the spirituality of Christian meaning of suffering in the terminally ill patients. He emphasized that as a Sister Doctor, one has to accompany the patient in their suffering and help the family members through counselling, guidance and moral strength. In conclusion, he wished them God’s blessing and blessed the Sister Doctors with the Irish blessings for their ministry. 1, Ashok Place, Near Gol Dak Khana New Delhi - 110 001, India.